Local Directions: The park is located 2.5 miles west of the intersection of County Highway M and State Highway 27, then 1/2 mile north. A group of us went camping here last year - we had to get two sites right next to each other, which was no problem, because we had three tents (and they only allow two on one site). One of our sites (where we spent most of our time) was huge! We loved it. It offered enough privacy from the neighboring sites, which made it feel like we weren't on top of one another. I recommend taking a walk around the campground and further out. It's great to see the cabins nearby and everyone out on the lake. The beach is a little smaller than what I wanted, but all the kids there seemed love it. 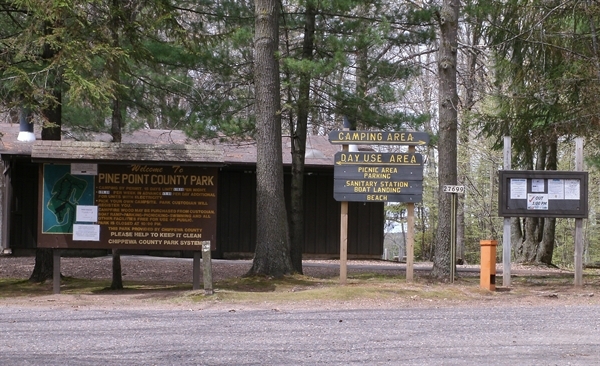 Pine Point is a cozy campground. I'll definitely be returning.